Now, I’m not being one of those overly proud dads here. I mean, if you follow the logic of the Drake Equation, I’m suggesting there literally may be thousands, if not millions of organisms in the universe that are almost as good, maybe even as good, as Abigail. But seriously, where’s her competition going to come from on Earth? She’s clearly the best human, so what other species holds a candle? Camels? I’ve seen camels. Ain’t no camel coming close. Even dolphins only come close. 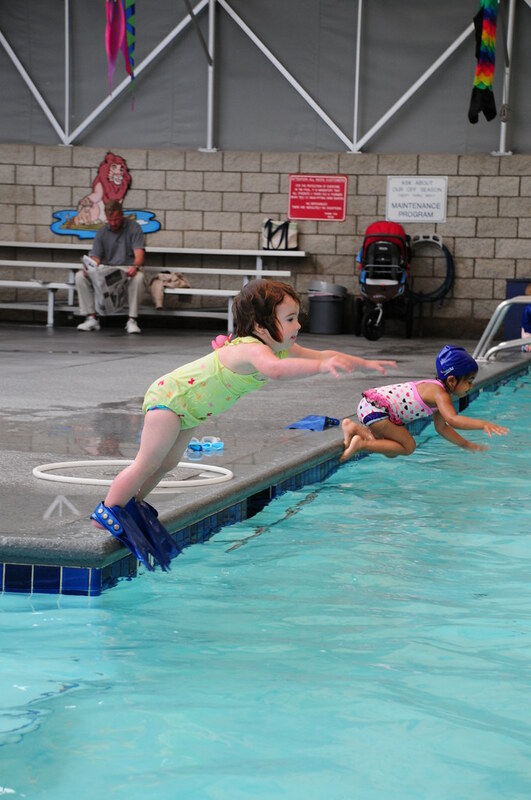 She’s even going to be a better swimmer than they are. In Abigail’s swim class today, her instructor, Bret (or Mr. Bret, as he is know around the 2 and under set), gave her an appraising look and asked me how old she was. The answer, of course, is just over two. He rocked his head from side to side, lips pursed, clearly debating something. “The next thing we have to teach her we don’t start with kids as young as her,” he said, clearly torn on the issues of advancing her already advanced aquatic education. The next step, it turns out, is popping her head up to take a breath mid-swim. Right now, she can swim underwater from one side of the pool to the other without a breath. 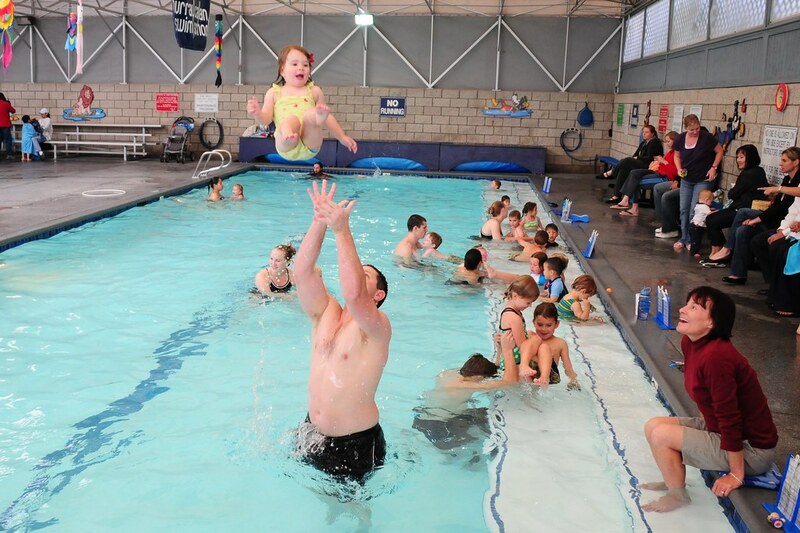 They teach them that way because when a kid goes vertical in the pool, they sink. Better to keep them flat in the water until the reach the edge. She’s also done a lot of drills hauling herself up out of the pool. 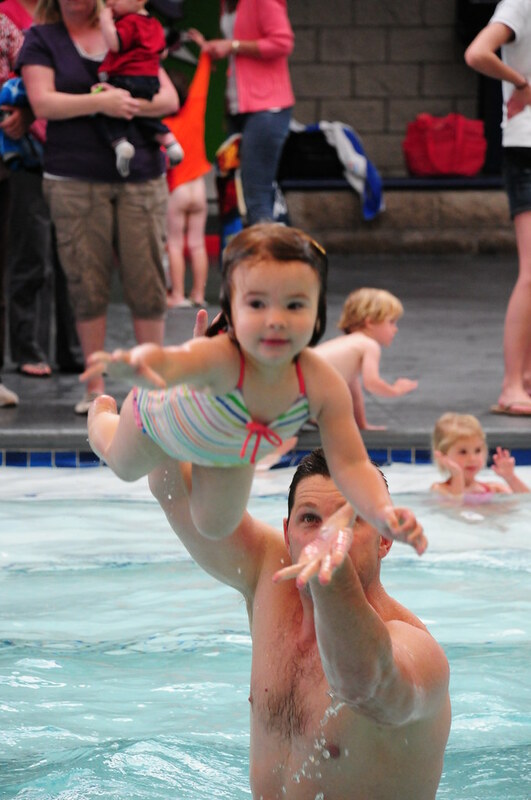 Helpful stuff if you’re two and frequently around a swimming pool. But taking a breath in the middle of her swim requires her to tread water for a second and then lower her head back into the pool and keep going. 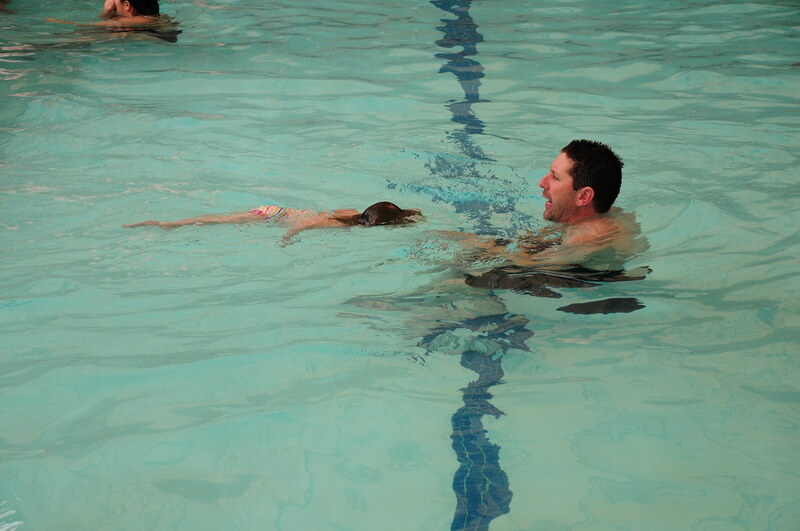 Even with older kids, the tendency is to pop the head up, tread water and stay there, panic increasing as the second pass and the instructor stares at them with weary, weary eyes. Bret decided to give her a chance. Abigail leapt from the edge, chasing Bret across the pool. He had her lift up halfway across and she immediately dove back down to continue pursuit of her underwater quarry – ie, whatever toy Bret just picked up off the edge of the pool. Usually something brightly colored. They went through this drill several times. Abigail never missed a beat. Her biggest problem was that she’s so good at holding her breath, she didn’t really feel the need to come up. Bret said you never see kids her age that advanced, doing something like that at 25 months. I pointed out that she’s not 25 months until next week, actually. So there you have it. Documented proof of Abigail’s greatness. What you got to say now, camels? 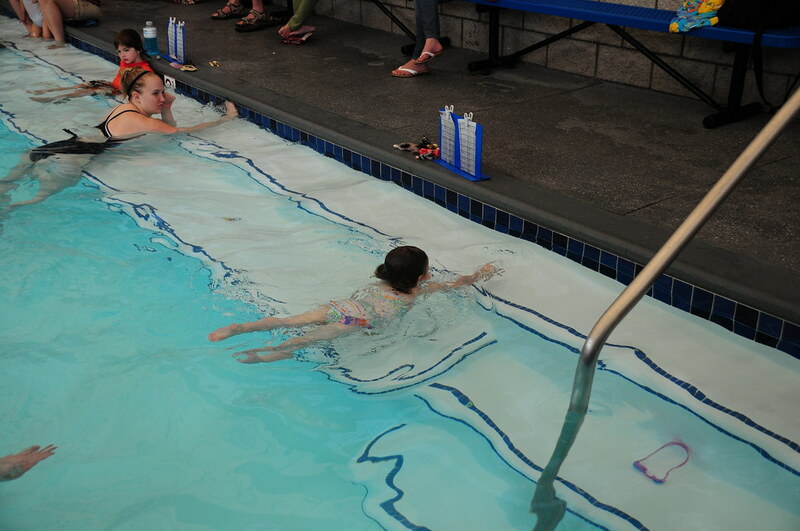 This entry was posted in Abigailia and tagged Evolution, Swim Class. Bookmark the permalink. These are really fantastic pics. All credit goes to the grandparents. We weren’t even present when they were taken.